The original Tarantula has been sold out world wide. Since the Tarantula II has been completely re-invented, there is a small delay and it will be announced by March 1st. "It is a work of real art, very ingenious and very practical." 2. I've compared Mesika's electric motor Tarantula to other motorized reels, whether driven by a rubber band motor or other electro-magnetic motor. In my opinion Mesika is attempting to forge a place in the market without regard to the true quality of his products. Forget about his battery powered Tarantula being utterly unreliable (the watch battery that powers the tiny motor drains quickly). The Kennedy reel absolutely predates Mesika's so-called break-through is easier to handle, easier to conceal, and easier to dispose of, and its power is more reliable. 3. Mr. Mesika relies only upon one relatively novel but not unique adaptation to his thread reel that differs from other thread reels being made today; he mounts his somewhat weak motor and the separate thread reel into a plastic finger shell rather than installing it inside a more durable brass, metal or other solid device -- with a hole or slot through which the thread passes. However, even the use of a finger shell is arguably not original. Check out Michael Ammar's Second DVD, &quot;Easy to Master Thread Miracles.&quot; He describes the Great Thurston as using a thumb-tip as an anchor point for a levitation effect using a human hair. Yigal, you couldn't have even been born then; the use of such anchor points are likely public domain, not subject to patent. 4. The Mesika electric motor is no advance over the James George motor that consists of elastic rubber bands; Mr. George's reels will never run low on batteries or pulling power. Yigal's will. 5. My opinion of his Tarantula is that is it sheer marketing. a. My opinion after comparing a James George or Kennedy reel to Mesika's, is that Mesika's device is more easily detectable and unreliable; the Mesika reel cannot be easily palmed as with the Kennedy reel or concealed as the James George reel. 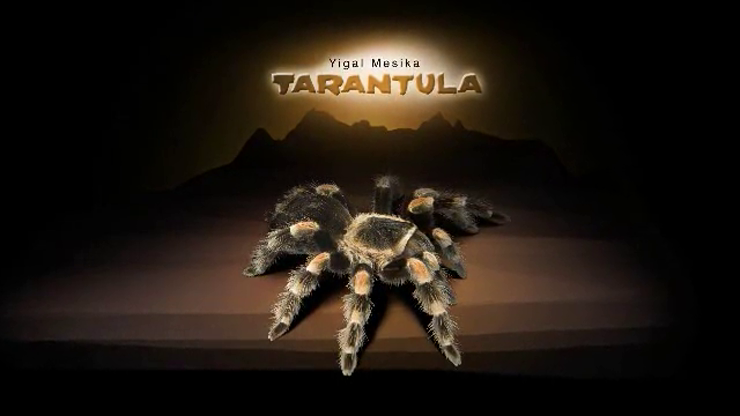 In fact, according to Mesika's own marketing he names it the Tarantula because of what appears to me to be a most uncomfortable and unnatural manner in which you must hold your hand (like an upside down, palsied claw, which he likens to appearing as if its a &quot;tarantula spider&quot; in order to hide his device). b. Keep in mind that BOTH hands of any performer must look the same in order not to call attention to the gimmick. c. Having used his Tarantula reel in performance, I find it cumbersome, annoying and especially irksome when the fresh battery simply falls out of its own accord. Mesika emphasizes in his video that &quot;threads don't break,&quot; but that &quot;you break them through your mishandling.&quot; To some extent that may be true. But when it comes to his device, I hold him to a reciprocal standard - his device shouldn't fail in performance because it is clumsy and unreliable. It should fail because the performer hasn't developed the skill to use it. In the Tarantula's case, its poorly crafted. NO amount of practice will bring about a stellar performance if the prop simply is not capable of delivering every time. The Mesika Tarantula is a hit-and-miss device. My opinion? Stick with the tried and true. Avoid Mesika. 6. Further, Mesika seems to acknowledge a problem of detection with his reel in the DVD he supplies. In his DVD he actually recommends putting sandpaper to the gimmick and applying makeup to it in order to make it appear more like your own skin. Wow. What a poor recommendation. Aside from creating a mess (and clogging the thread slit with makeup product) it should go without saying that skin is not uniform in color to begin with. Try to duplicate it in just one or two makeup colors. It's virtually impossible to create with makeup an acceptable camouflage of your various skin tones, even when it pertains only to your hands. 7. Also, the &quot;slit&quot; at the top of the Tarantula must be aligned optimally such that the thread hangs down from the gimmick (your fingers must be essentially pointed upwards in order for the motor to run without friction of thread being dragged across the flesh of the finger upon which the gimmick is worn. 8. There is much talk about the battery being fresh when used to perform. Fair enough. But the battery is held in so precariously that it can easily slip out of place, leaving you with an un-powered gimmick while the fresh battery skitters away on the floor. IT IS GREAT! Some time needed for training but Yigal makes his job well & DVD teach all you need to perform this GREAT (again) trick. Just got the item today.Very powerful effect but the gimmick is a bit hard to fit on me.But overall can certainly do a lot of wonderful things with it! Well this is so good I wanted to give it 5 more stars. I have been doing the ring trick with this now and it kills. The best trick I got all year. All the tricks on the D.V.D. rock. Yigal Mesika is the best IT worker of all time. Simply enter your details below and we will send you an e-mail when “Tarantula (With DVD) by Yigal Mesika - Trick” is available to ship!